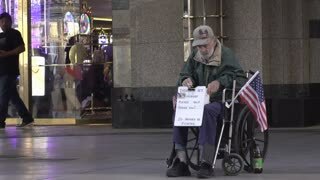 Search Results for "homeless veteran"
Homeless veteran man holding sign close up that says "Homeless veteran, God bless" with rolled up American flag behind him. 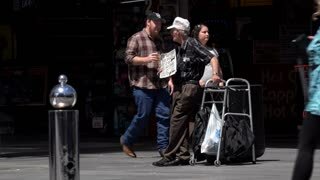 Homeless veteran being interviewed and talking with his hands while holding sign saying, "Homeless veteran, God bless". Wide Shot of a Homeless Veteran on the Sidewalk Holding a Sign Asking for Help. Wide Shot of a Homeless Veteran Sitting on the Sidewalk Holding a Cardboard Sign asking for Help. 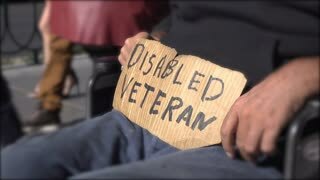 Homeless veteran sitting and holding cardboard sign, talking with his hands, interview styled. Close Up Isolated Shot of a Cardboard Sign of a Homeless Veteran Asking for Help. 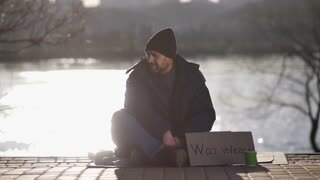 4k, Homeless and hungry veteran begging for money whilst sitting at a sidewalk. A homeless man holds out a begging cup and a sign stating he’s a veteran and asking for help. Poor grandfather suggests weight loss for money. So he earns a living in poverty. Close up. Archival film of Vladivostok, Siberia, Russia from 1918 features poor Jewish workers and refugees. Archival film of Vladivostok, Siberia, Russia from 1918. Man with elf had and red beard walking out of frame revealing neighborhood watch area sign. Breath in the cold air from homless man breathing covered in a blanket. Homeless man eatting bread wrapped up from the cold wearing christmas hat. Close up of hairy mans face wearing hoodie eating bread in the cold. Dog shivering in the cold as homeless man feeds it bread while he is bundled up from the cold weather. 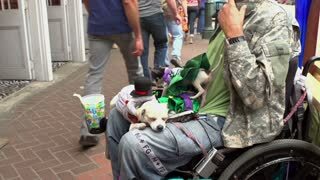 Homeless man sitting on the ground petting dog while covered under blanket from cold weather. Close up of homeless mans face eating bread while bundled up from the cold weather. Homeless man pushing cart down the road with dog following him as he is wearing an old blanket to keep warm from the cold. A veteran finds himself destitute and begging on the streets. Homeless man pushing shopping cart down the street loaded with his belongings. Pan up from cart to homeless man standing and rack focus to neighborhood watch sign. Homeless man standing and looking around covered up in blanket to keep warm. Homeless man pushing cart down neighborhood street wearing creepy elf hat.